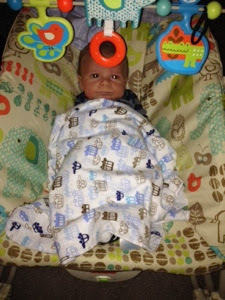 Apparently babies can’t read minds because his crying got louder and louder. Instead of feeling sorry for myself and my lack of sleep, I pulled myself out of bed. “What’s the matter sweet baby boy?” I whispered in Coop’s ear and kissed his forehead. I carried him across the dark bedroom and greeted Bandit in the hallway. “Hi buddy,” I said to Bandit as I almost tripped over him. We reached Cooper’s bedroom and I put him in his crib for a moment. I started to warm up his bottle in the bottle steamer for our nursery, which is a great invention and investment whether you are bottle feeding breastmilk OR formula feeding. His crying got louder and louder. 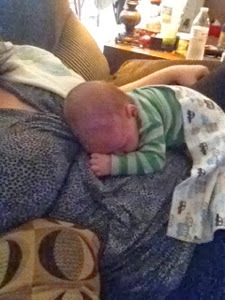 Before I could get a fresh diaper under Cooper’s bottom, it happened. He sneezed, farted, and then let out a giant poop ALL at once. I literally had to check the walls for poop because I was nervous the poo flew across the room too. Poop was all over Coop and his jammies. He instantly stopped crying and made the funniest face in the world. 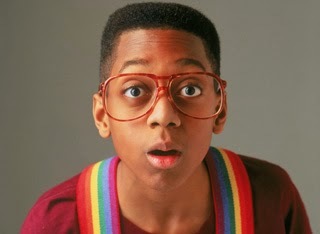 I didn’t have time to take a picture (obviously), but his face and expression reminded me of Steve Urkel. 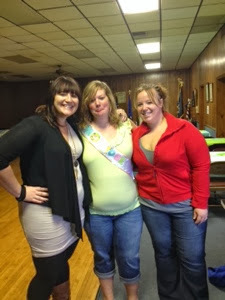 But despite the hectic morning, we had to get up early for my sister’s baby shower. We were running late and I had to make a tough decision. “I can’t believe you’re doing this,” Justin said as he was getting ready to jump into the shower. I was kidding (or was I!?! ), but I REALLY didn’t want to leave my boys for more than 13 hours. I gave Justin a sad look and snuggled up with Coop / gave him a bazillion kisses before I left. I had to stop at Marsh to pick up some cupcakes for the baby shower. That’s when I saw a pregnant lady. And the woman in front of me at the check-out line had a baby with her. I’m going to pick them up. It’s okay if I am a little late, right?! No, they need you there early to help decorate! None of the bottles are clean in the house. And you’ll need to feed him and rock him to sleep before you leave. But everyone will want to see him! And you’ll miss him like CRAZY! Just go back home and pick them up. After having a conversation with myself (hopefully not out loud), I called Justin. “Already?” Justin said when he answered the phone. So I hung up the phone, started crying, and drove until I found the nearest Starbucks. An hour later, I called Justin to check in everyone. “Where are you?” Justin asked. “Oh wow, you made it a lot farther than I thought you would!” Justin said. “I can see you on the couch together,” I said. “Wrong – we are on the computer changing my fantasy football line-up,” he said. Two of my lovely sisters. 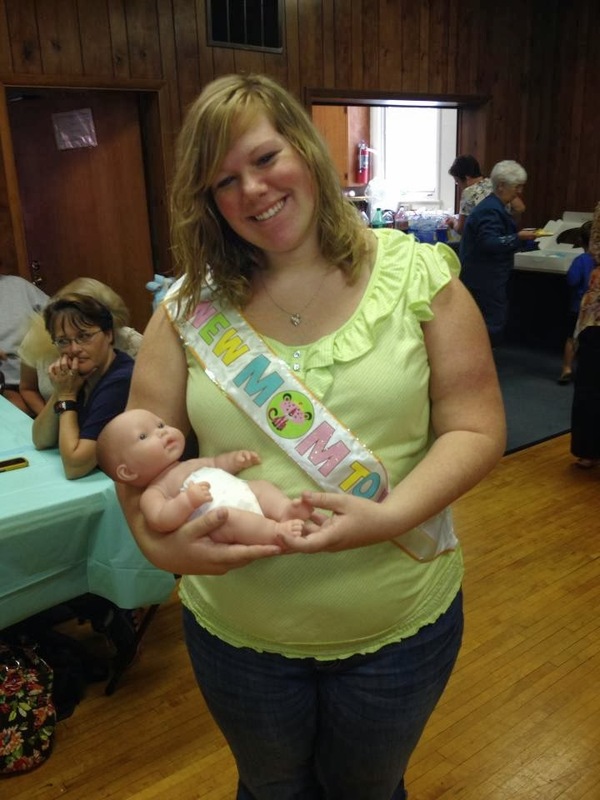 Happy baby shower day, Britt! 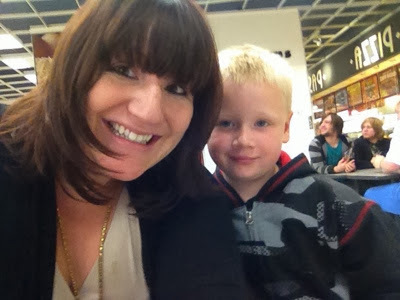 Once we were done decorating, I took my nephew to run some errands before the shower started. Of course, he wanted to pick up some toys from Dollar Tree. I said yes – as along as he picked up some toys for his brother too. I told him they could each get two things – so I let him pick out whatever he wanted. He had picked out a recorder – you know, the ones you get in middle school and feel like a total rockstar when you can play the theme song to Star Wars? Don’t mind us- we were just singing “What Does the Fox Say?” while waiting on pizza. Once we got back to the hall, I realized he also picked out sticky bugs. Yup, your mom is definitely going to kill me. Braxen ran down the hallway with his toys and started playing his “flute”. “I may or may not have let him get a recorder today from the store,” I said with a guilty face. “ASHLEY!” Sarah said, while laughing. We couldn’t stop laughing. I found Braxen and asked him to put him his recorder. But that didn’t last long…half way through the shower, it got really quiet and in the distance you could hear a recorder playing. Sarah and I made eye contact and she shook her head. She mouthed the words “PAY BACK” to me. Then I spotted Braxem in the hallway, skipping along with his recorder. He stopped playing and told me he was just testing it to make sure it still worked. Oh kids. Always so clever. After Britt’s shower, I stopped in Muncie to cheer on my little brother at his football game. He made the Homecoming court and I was beyond proud of him! We could only stay for the first quarter because I was taking Britt to see her mom (my step mom) in the hospital. Unfortunately, my step mom got really sick this past week and had to be admitted into the hospital in Indy. Britt was really sad her mom couldn’t be there for her baby shower and I promised I’d do whatever it took to make sure she saw her mom on her important day. 13 hours later, I finally made it home. Coming home to this smile will NEVER get old. That’s the longest I’ve ever been away from Cooper. I felt like a piece of me was missing – literally I felt as if a piece of my body gone. I know Coop was in safe hands with his father, but that didn’t stop me crying and constantly thinking about him! Thankfully, Justin kept me entertained by sending me updates and pictures throughout the day. Do you think our daycare will send hourly updates and pictures for me too? How about just for the week or year? Either one. Not that being a stay-at-home-mom isn’t a tough job!! I firmly believe that being at stay-at-home-mom is an extremely important and hard job too. But it’s tough leaving your little one, especially with a “stranger” if you aren’t fortunate enough to have family or friends available to watch your kiddo while you work. And I know people who have returned to work in as little as 4 or 5 weeks …that’s how old Coop is now! 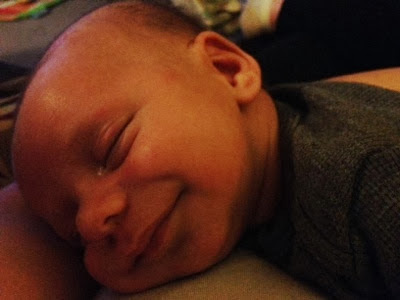 I can’t imagine going back to work already…I feel so blessed that I get 12 full weeks off with Cooper. But it’s hard to believe that I am ALMOST half-way done with this journey though…Cooper will already be 5 weeks old this Thursday! Pretty soon, Cooper will be running around our house with a recorder that my sister gave him as a sussy (aka gift for no reason). Because that’s what aunts do!